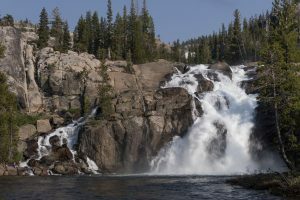 Follow the Tuolumne River as it goes from a lazy river to a series of powerful cascades and falls down to the Glen Aulin High Sierra Camp. 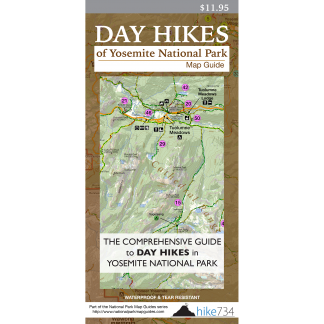 The trail begins on a gravel road to Soda Springs (see Soda Springs in 0-5 Miles) through a mix of forest and meadows backdropped by the dramatic peaks of the Cathedral Range. Continue on the Pacific Crest Trail through a mix of forest and meadows, crossing a couple creeks. After a wide bend in the river, the trail begins descending into the canyon, crossing over smooth landscapes of granite broken up by sections of forest. The river, once lazily meandering through the meadows, now frequently drops and cascades over the rocks. A granite outcropping features an interesting pile of younger, gray volcanic rock that’s piled up on the opposite side of the raging river being pinched below. Open views into the Grand Canyon of the Tuolumne River spread out to the west, and you begin your descent in earnest. The trail drops through the forest to a lovely twin bridge over Tuolumne River and the beginning of a string of continuous cascades. The trail winds down into the canyon over the granite and through the forest, frequently coming alongside this delightful section of river. While the prolific cascades could be mistaken for Tuolumne Falls, this powerful waterfall (approximately 4mi/6.4km into the hike) is unmistakable as it drops 100ft/30m right alongside the trail. You’ll then wind through the forest and drop down to the flat area where Glen Aulin High Sierra Camp sits. White Cascade drops into the large pool in this area. Take the bridges over to the camp. Turn around here or continue on down the river to visit California Falls, Le Conte Falls, and Waterwheel Falls (see Waterwheel Falls). Trailhead: Park at the signed Lembert Dome Picnic Area located at the east end of Tuolumne Meadows. Trail begins on the gated road that continues west.